North Carolina’s hospitals and health systems are anchors in our communities, supporting the local economy as a major employer and as a healthcare safety net provider. Our state is home to some of the most advanced academic medical centers in the nation, where cutting edge research is transforming medicine. A network of teaching hospitals supports training for tomorrow’s physicians, nurses and other medical professionals. Mobile screening vans criss-cross North Carolina’s 100 counties, providing our neighbors with access to preventive care as well as early diagnosis and treatment. NCHA recently worked with RTI to create and release and economic impact report outlining the incredible impact that NC hospitals have beyond acute care, enhancing the economic strength of our state. NCHA is partnering with health systems all across the state to present the findings from this report to groups of economic developers, workforce board members, chamber leaders, and community members. 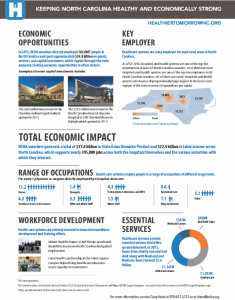 2018 AMA Report on Physicians’ Impact on the NC Economy – NEW!!! American Hospital Association Annual Report – NEW!! America’s hospitals supported 16.5 million jobs and almost $3 trillion in economic activity in 2016, according to the American Hospital Association’s latest annual report on hospitals as economic drivers in their communities. Hospitals are one of the top sources of private-sector jobs, directly employing nearly 5.9 million people in 2016. Each hospital job supports about two additional jobs, with every dollar spent by a hospital supporting roughly $2.30 of additional business activity. The report shows the total economic impact of community hospitals by state, including jobs, payroll and hospital expenditures. Click here to explore the data in a new interactive format.